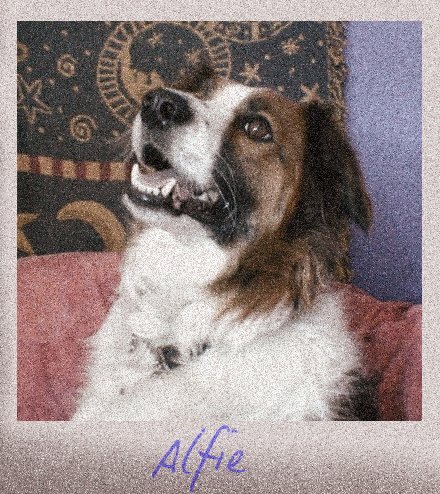 Alfie was a beautiful spaniel cross collie with the most amazing eyes – they looked like he’d painstakingly applied eyeliner every morning. Coupled with his stunning red coat and bouncy personality, Alfie was the most lovely dog you could ever hope to meet. A homecheck had been carried out for a potential adopter; she lived up in Northumberland, and had to make a six hour journey to come and meet him. Alfie greeted her with his usual enthusiasm. He adored her dog, and was playing very well and interacting in all the ways you’d want a potential new home and dog to do. Having spent a couple of hours getting to know him, we were all happy that this was the right home for Archie. We went through all the important information about him and it came to the moment where we were to say goodbye. Alfie trotted quite happily up to the lady’s car, and jumped in. Her dog also jumped in. At that moment, Archie looked at us, at the lady, and then back at us. He consequently jumped out of the car, and ran back to the house, laying on the doorstep, putting his paws over his nose.